It’s a long weekend here in Queensland! Woohoo! So, what’s the plan? Well, first off, I’m visiting the Brisbane Stitches and Craft Show tomorrow! There are some wonderful exhibitors, and some fantastic tutorials and presentations! I’m hoping to meet up with some lovely fellow BrisStylettes, and maybe splurge some of my KRudd money on some handmade goodies! I also managed to score a goodie bag from the wonderful Peppermint Magazine by replying to a tweet in time! Can’t wait to get my mitts on it 🙂 I’m planning on getting myself a subscription to keep up with the eco crafty and arty goodness. 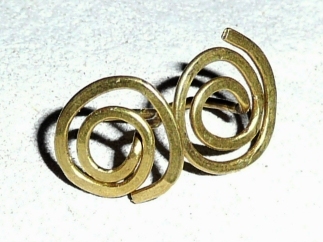 I’m also hoping to spend some time making some more of these sweet little spiral studs. Hopefully some other new designs, too! And finally… I’m working on launching a new site! Very exciting… but I’ll tell you more about that soon!